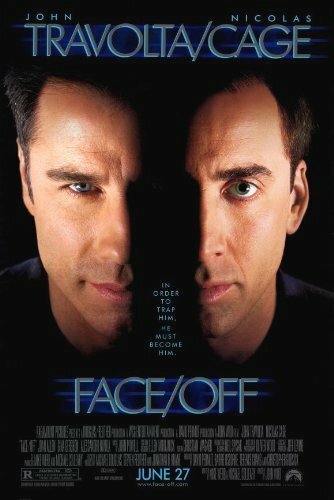 Face/Off – Did You See That One? FBI Agent Sean Archer (Travolta/Cage) has dedicated his career to capturing Castor Troy (Cage/Travolta). His motivation is more personal than professional. When he finally has his man, Archer undergoes a unique procedure to assume Troy’s identity. Now he’s trying to locate a dangerous bomb set by Troy. He runs into a serious complication when Troy escapes, assuming Archer’s identity. Now their game of cat and mouse includes the question of identity. This action thriller was written by Mike Werb (The Mask) and Michael Colleary (Lara Croft: Tomb Raider), and directed by John Woo (Paycheck). The cast features Nicolas Cage (Moonstruck), John Travolta (Pulp Fiction), Joan Allen (The Bourne Legacy), and Alessandro Nivola (Coco Before Chanel). This is a movie built around the action. The quiet moments are few, and the action sequences are extensive. The result is a movie that moves quickly, and is pretty fun to watch. The dialogue is the predictable kind found in most 1990s action films, but it works with the overall feel of the film. The most interesting aspect of the film is the premise of the story. This is one of the more unique ideas I’ve seen in an action movie. This also put forth a big challenge for the two stars of this one. Overall, this story does everything I hoped it would. John Travolta and Nicolas Cage were given a unique challenge when they signed on for this movie. First, they had to create the character they were going to play. The next step was learning to play one another’s character. The two do a great job with this challenge, making the movie pretty fun. The story really benefits from their ability to adjust to the differing circumstances of the moment. Joan Allen and Alessandro Nivola also do good work in this one. Some of the smaller roles do come off as a bit cheesy, but it’s not a huge problem. While the movie might be driven by the action, it’s solidified by the performances of the stars. The action sequences in this film just seem to go on and on and on. John Woo likes to shoot things, and he loves to blow things up. I don’t agree with the critics of this film who found it too loaded with non-stop action. However, I do see several moments where the action seemed to go on too long, almost hurting the payoffs of those moments. The film brings together all of the production aspects that make a good action film. The movie also earned an Oscar nomination for Best Sound Effects. This is a fun movie that pays off with a fun conclusion. The premise is interesting enough to elevate this film to something more than a forgettable action flick. If you’re a fan of action movies you should check this one out. I would also suggest this to fans of any of the stars. I give this one 3.5 out of 5 stars. Pingback: Con Air | Did You See That One? Pingback: The Crucible | Did You See That One? Pingback: Unstoppable | Did You See That One?